During a trip to Hyde Park on Saturday I had the good fortune to make a new friend in 71-year-old Colin who, he wouldn't mind me saying, was a complete squirrel nutter. During squirrel feeding, dog scaring and story telling (unrepeatable here) Colin shared his collection of wildlife photographs taken in some of London's other Royal parks. Tamara and I took inspiration from Colin's enthusiasm and decided to spend Sunday taking in some new scenery at Regent's Park. 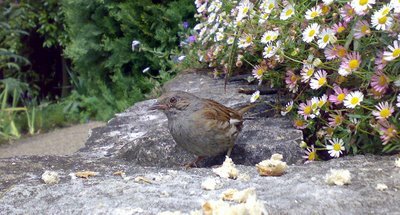 That's where we found this Dunnock with three others. Thanks to the dedication of a Robin nutter's daily serving they were as tame as it gets.